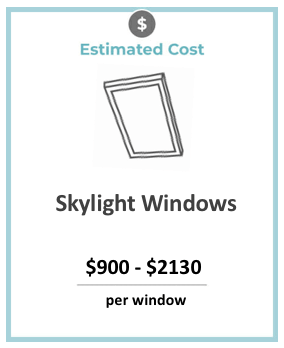 The average cost for a replacement skylight window installation is $900 to $2130 per window + labor costs which can average around $38 per hour depending on your local window installers average price. See local window prices below. Skylight windows bring sunlight in through the roof of the home and often offer useful ventilation to let heat out during the warmer months of the year. Some skylight windows even serve as emergency exits. Skylight windows are one of the best options for ventilation and safety in an attic room with slanted ceilings. That’s because you can’t fit most standard windows in that angled setup without them leaking. Skylight windows are designed to keep the water out, but they will also help allow air into your home or even allow escaping during a fire if that’s a concern. Although skylights are one of the least common windows used in homes today, they are still a great option for bringing sunlight in through the roof of the home. Unlike most windows installed on a home, maintenance is vitally important for skylight windows. If they aren’t maintained properly they will eventually start leaking and cause issues in your home. Annually inspect your skylights from the roof while paying particular attention to the flashing surrounding the skylight. If you’re going to install a skylight window over top of furniture, carpeting or other items in your home that can be damaged by UV light you should consider a Low-E treatment to help keep out the more damaging rays. It will keep UV rays from making it into your home and help keep everything in better shape overall. 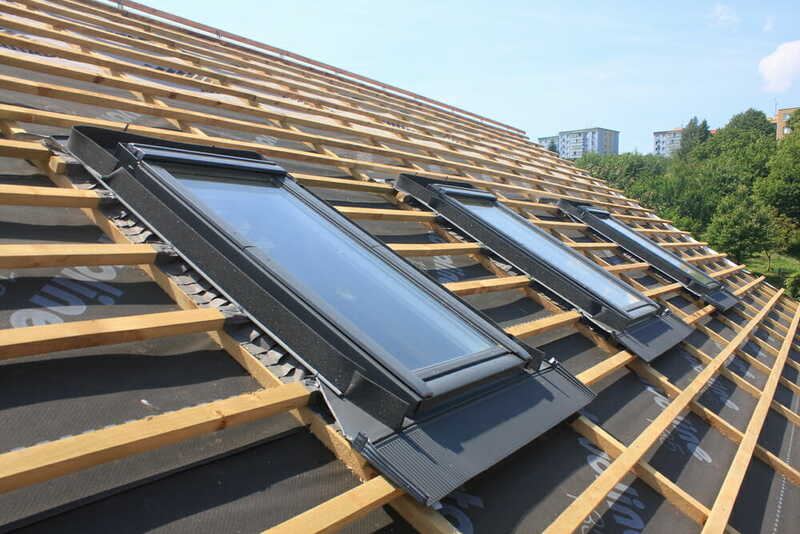 There are several different types of skylight windows to choose from. Some open fully, others don’t open at all, and there are various options in between. Fixed skylights are nonmoving. These roof-mounted windows don’t open in any way and can’t be used for ventilation purposes. They tend to last the longest and require the least amount of maintenance. Manual venting skylights typically crank up and out to provide ventilation. They’re simple to operate and work similarly to an awning window. You crank the handle in one direction to open the skylight and crank it the other way to close it once again. An electric venting skylight works much the same as a manual, but it’s electrically powered. This is handy for skylights positioned in hard-to-reach areas. You press a button and the skylight opens, you push another button and it closes. Some even run off solar power and have rain sensors to open and shut the windows automatically depending on the weather conditions. Roof windows are the option you’ll want to choose for attic rooms with no flat walls. These windows open up and out all the way, offering the occupants a way out of the room in the event of a fire. They’re often required by code and they make an easier option than adding a dormer with a standard window. Skylights are a good option in upstairs bathrooms to let trapped humidity out, and they can let out summer heat to keep a house cooler as well. Most people who think about adding a skylight window to their home worry the skylight will leak and lead to water damage eventually. Improved flashing and skylight designs help make these sections of your roof watertight. Skylight windows are a nice option for accenting your home and bringing in more light; yet they can also ventilate a room or even provide an escape route. If you do decide to have a skylight window added to your home make sure that it’s sealed with flashing properly and consider adding in things like insulated glass and low-e treatments to help protect your home and keep it insulated.